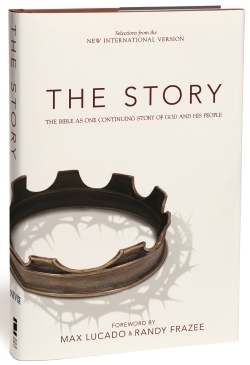 Fairfield Grace will be embarking on an exciting journey starting the week of October 15, 2018 by reading the Bible in a whole new way, through “The Story“, written by Max Lucado and Randy Frazee. Some of you may remember several years ago when we did this study, but times have changed and we have changed since then, and the wonder and beauty of God’s story change in their relevance and meaning for our lives along the way. Our children’s program will also be following The Story with a specially written version just for them. Check out the Sunday School Ministry for more details. What did you learn about God, yourself or others in this chapter? How do the events in this chapter relate to the overall Story and God’s pursuit and redemption? What do you struggle to understand or embrace from this reading? Write a one or two sentence summary of this chapter. Write out a prayer to God of appreciation or petition. How does this chapter point to Jesus, or challenge you to be more like Him? Is there something you learned that needs to be shared with others?